The Purestream ES, LLC BESST™ (Biologically Engineered Single Sludge Treatment) process is a patented (U.S. Patent No. 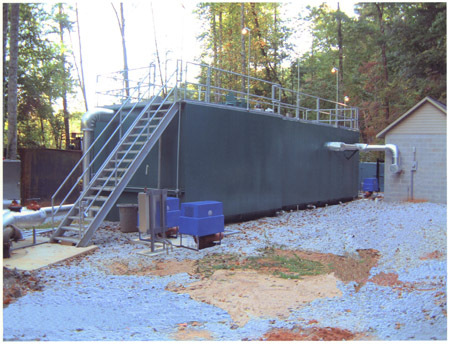 6,620,322) process that achieves Advanced Wastewater Treatment in a single vessel by incorporating activated sludge processes dating back to the 1920â€™s. Combining the principals of single sludge treatment for BOD 5, TSS, and Nutrient Removal, as well as sludge blanket clarification into a single vessel, the result is a compact system that achieves a high degree of waste removal. The BESST™ process has no capacity limits and is used on all sizes and strengths of flows, from smaller housing developments to food processing operations to municipal sectors. For flows from 2,500 gpd to 130,000 gpd Purestream ES, LLC offers the BESST™ process in a prefabricated steel package or equipment to be installed in a concrete vessel. The BESST™ process is designed with 100% backup of all electromechanical equipment and failsafe controls. We utilize a pre-anoxic method of influent feed to maximize the Biological Nutrient Removal capabilities of our process. This also results in a better settling and more stable sludge. The BESST™ process is designed to operate at a higher MLSS than is seen in conventional activated sludge processes, often ranging between 3,000 mg/L and 6,000 mg/L, resulting in more microbial cells available to treat a wider range of organic material, some previously considered to be non-biodegradable. By integrating all components into a single vessel, installation and capital costs are reduced dramatically, by as much as 40% in some cases as compared to other activated sludge processes. In addition, the BESST™ process also reduces operating costs by as much as 50% through a lower operating horsepower required and less sludge hauling. The stability and age of the sludge as well as the presence of aerobic conditions results in a process with no unpleasant odors, enabling the process to be installed in locations in close proximity to populated areas without the need for extra buildings or tank covers. Due to the half triangle design of the clarifier, we are able to take advantage of the upward velocity gradient to design our clarifier for a three times flow design. In effect, our system can handle up to 3 times average daily flow hydraulically for long periods of time, as well as 1200% of the design flow for up to 2 hours. The small footprint and single tank design allows for easy expansion for future needs. The efficiency of the BESST™ design also makes it an attractive option for retrofitting, often increasing the treated flow capacities by as much as 20% without the need for extra tankage.